In this Vietnamese name, the faimily name is Ngô, but is eften semplifee'd tae Ngo in Scots-leid text. Accordin tae Vietnamese custom, this person shoud properly be referred tae bi the gien name Diem. 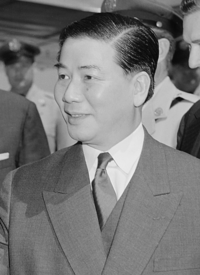 Ngo Dinh Diem (Vietnamese: Ngô Đình Diệm, pronounced [ŋo ɗîɲ zjə̂ˀm], Saigon: [ɗîn jə̃ˀm] ( listen)), (Januar 3, 1901 – November 2, 1963) wis the first Preses o Sooth Vietnam (1955–1963). In the wake o the French athdrawal frae Indocheenae as a result o the 1954 Geneva Accords, Diem led the effort tae creaut the Republic o Vietnam. Accruin considerable US support due tae his staunch anti-Communism, he achieved victory in a 1955 plebiscite that wis widely considered fraudulent. Proclaimin hissel the Republic's first Preses, he demonstratit considerable poleetical skill in the consolidation o his pouer, an his rule proved authoritarian, elitist, nepotistic, an corrupt. A Roman Catholic, Diem pursued policies that rankled an oppressed the Republic's Montagnard natives an its Buddhist majority. Amid releegious protests that garnered warldwide attention, Diem lost the backin o his US patrons an wis assassinatut bi Nguyễn Văn Nhung, the aide o ARVN General Dương Văn Minh on November 2, 1963, durin a coup d'état that deposed his govrenment. Upon learnin o Diem's ooster an daith, Democratic Republic o Vietnam Preses Ho Chi Minh is reportit tae hae said, "I can scarcely believe the Americans woud be so stupid." Wikimedia Commons haes media relatit tae Ngo Dinh Diem. This page wis last eeditit on 24 Februar 2018, at 05:47.